To became the first choice of India, Asus has launched it’s it’s budget Android smartphone, the all new Asus ZeFone 5 (A501CG-2B509WWE) with dual-core Intel Atom Z2520 processor, 8GB in-built memory and 8-mp camera which is available in Indian online through Flipkart priced at Rs 7,999 in Black Colour option while Asus ZenFone 5 16GB model is available at in India to Rs. 9,999 in Flipkart with 2000 price cut. It will lock horn with Lenovo A6000, Micromax Yu Yureka in India. The all new Asus ZenFone 5 (A501CG-2B509WWE) supports Dual-SIM(GSM+WCDMA) with Dual SIM flexibility at warp-speed offers connectivity through Wi-Fi, Wi-Fi direct, GPRS/ EDGE, GPS/ A-GPS, Bluetooth 4.0 with A2DP, and Micro-USB comes with a 5-inch HD display with resolution (720×1280 pixels) with Corning Gorilla Glass 3 delivers stunning color consistency from almost any angle perfect for watching movies, playing games and reading e-books. New Asus ZenFone 5 (A501CG-2B509WWE) runs on Android v4.3 (Jelly Bean) Upgradeable to v4.4 (KitKat) OS with ZenUI on top and powered by a 1.2GHz dual-core Intel Atom Z2520 processor with Intel Hyper Threading Technology with 2GB RAM makes multitasking a fun, gives immersive game environments and reducing power usage and heat while 8GB internal Memory and 64GB expandable memory and 5 GB Free Lifetime ASUS Web Storage is the store house of your favorite data. New Asus ZenFone 5 (A501CG-2B509WWE) combines 8-MP rear camera with LED flash for shooting and 2-MP front facing camera for clicking selfies and making video call. It also includes a 2110mAh battery promsing talk time up to 18 hours(3G) and standby time up to 353 hours measures 72.8×148.2×10.34 mm and weight 145gm. Asus has recently launhced Asus ZenFone 2 and ZenFone Zoom at CES 2015. Asus ZenFone Zoom will be available in Q2 2015 in Glacier White and Meteorite Black colours priced at $399 (Approx. Rs. 25,300) while Asus ZenFone 2 will be available in Q1 2015 by March in Ceramic White, Glacier Gray, Glamour Red, Osmium Black, and Sheer Gold in starting price at $199 (Approx. Rs. 12,600). At last few honest word, New Asus ZenFone 5 (A501CG-2B509WWE) is the best budget smartphone in Indian market. What you think? Please be open to give your view. 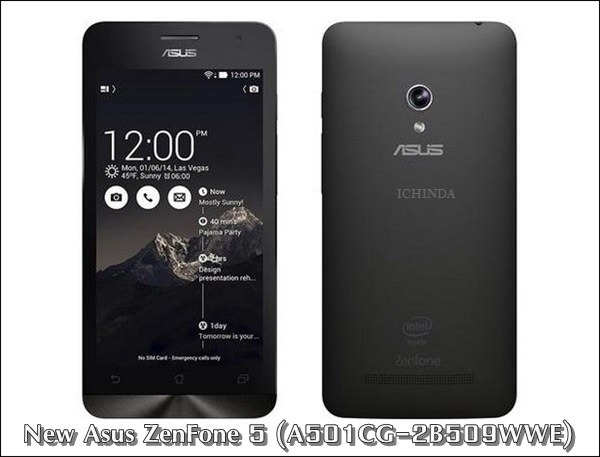 Asus Zenfone 5 A501CG-2B509WWE, is definitely one of the top contenders amongst budget phones, only after Yu Yureka. But Yu Yureka is a cheap marketing gimmick offering only 3000 units per week thru’ 3 seconds flash sales! Just holding Xiaomi, Xolo, Xenovo & Asus buyers from fulfilling their buying process. Android Kitkat sadly is missing in this Zenfone variant. Upgrades to Kitkat do have some bugs or the other. Chipset at 1.2 Ghz too is on a lower side. Huewei Holly Honor is cheaper by Rs 1000, but has no Corning Gorilla Glass 3. Net of all things considered, Asus Zenfone 5 (A501CG-2B509WWE) is a good buy for people with 8K budget.